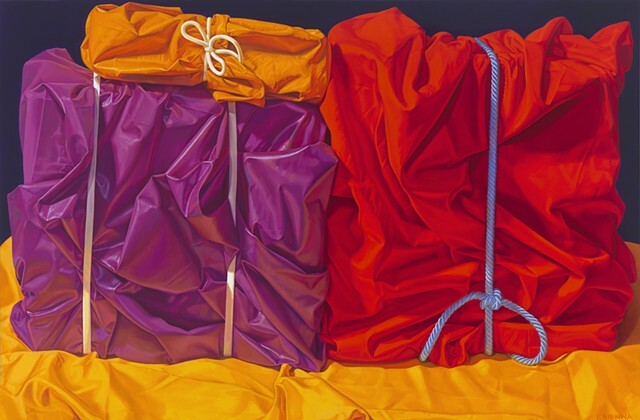 Sumptuous colored cloth, wrapped around objects and bound by cords, is the primary subject of Pamela Sienna's highly realistic still life paintings. She works directly from the objects placed an arm's length away from her easel. While painting, Pamela is deeply focused on seeing color casting into other color and interacting in and out of shadows and can only achieve this with time spent examining the actual objects under a steady spotlight working in the dark of night until dawn. Her wrapped and draped cloth subjects and her torn paper subjects (with tape, tacks and string) are rich in color, detail and visual activity. The illusionism can become trompe l'oeil in some areas. She achieves the effect with many thin layers of oil paint glazes, building up the color gradually with small soft brushes over many weeks of work. Larger paintings take hundreds of hours over months. (Her drawings usually do not come before the paintings but as a break during the long painting process.) She lays in her paintings directly with loose washes of abstract brushwork that eventually is honed into depiction of a solid form. See artist statements in folders Wrapped Cloth and Visual Stutter Series. Pamela Sienna has had 21 solo gallery exhibitions and has been in 12 museum exhibitions. Her paintings are in the permanent collections of the Evansville Museum in Indiana and the Danforth Art Museum in Massachusetts.